A generous heart In the months after the uprising, Fakharany and I ran into each other often at protests and sometimes met at cafes to talk about the state of the Egyptian uprising. He was ebullient and optimistic, despite increasing signs the military junta that had replaced Mubarak was uninterested in democratic reform in Egypt. We had only known each other for about four months when I experienced Fakharany’s generosity for the second time. In May 2011, a mob attacked a church in Imbaba, a warren of narrow alleys on the west side of Cairo. The mood in the area was still tense the next day, and as I reported with two colleagues, two men began following us. We sensed the situation was turning dangerous, but before we could find a safe place, the two men had multiplied into a crowd — and the crowd was turning violent. Just as they began shouting and grasping at us, we turned a corner and found a cordon of soldiers deployed to secure the area. They allowed us to squeeze past, and we were safe — for the moment. But I was still trapped in Imbaba, and it would be difficult to get out alone. I called Fakharany and explained my situation. “Stay there,” he said. “I’m coming right now.” Within half an hour, he arrived and escorted us to safety. Most of Fakharany’s friends have similar stories. His magnetic personality gave him a wide network, which was useful to a young news organization like Rassd. Fakharany’s key role at Rassd was in connecting it to outside groups, like Turkish and German news agencies, that worked with and trained the budding journalists. He often traveled to conferences and trainings abroad. He also sent in updates on protests or other developments in Egypt, which were published across Rassd’s platforms, including Facebook, Twitter, and text messages to subscribers. 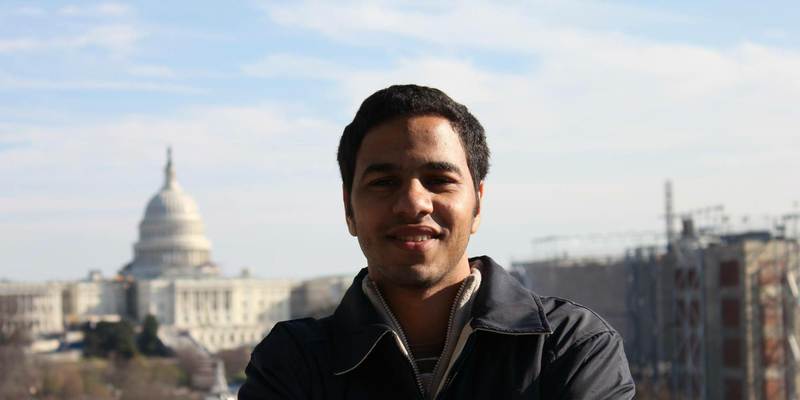 Fakharany quickly became a member of Rassd’s core team even as he continued his medical studies. He worked with intensity and, usually, a wide smile. “He was always taking the initiative, pushing ahead, knocking on doors,” said Khaled Noureldin, one of Rassd’s founders and CEO. Rassd was growing rapidly. By the 2011 uprising, it had a core team of 22 people who were publishing updates from volunteers around the country and had accumulated between 300,000 to 400,000 followers on Facebook. That rose to nearly 4 million by the July 2013 coup, according to Noureldin. The page currently has more than 10 million followers and operates underground in Egypt — Noureldin lives in Turkey, and reporters in Egypt don’t use their names. Noureldin said at least nine Rassd journalists are currently in prison, though only five have been publicly associated with the network. Some of the Rassd team belonged to the Muslim Brotherhood. Fakharany told me he was not a member of the group, which Noureldin confirmed. He said Rassd has no connection to the Brotherhood beyond the personal affiliation of some members. But Rassd’s coverage was unabashedly sympathetic to Islamist parties, which dominated elections in Egypt after the uprising, and to Morsi. Morsi was the first freely elected president in Egypt’s history, winning by a thin margin in 2012 over a candidate associated with Mubarak’s deposed regime. His win came just after a major power grab by the military that included dissolving the Islamist-led parliament. But the Brotherhood leader-turned-president governed with an overreach and incompetence that was compounded by hostility from state institutions and the mainstream press. His rhetoric, and the often sectarian language of some of his top supporters, alienated many non-Islamists. By the summer of 2013, he was deeply embattled, and Egypt’s media was as polarized as the public. Love in the firing line As the country was choosing sides around him, Fakharany was falling in love. In a Rassd workshop on social media strategy in May 2013, he met a young woman who had traveled to attend the course from her home in another Arab country. The pair quickly became enamored of each other. She found Fakharany smart, open-minded, respectful of women, and loved how he was “always smiling.” Fakharany was “infatuated,” said Mohamed Soltan, an activist who was imprisoned alongside Fakharany for more than seven months. The two bonded over their love of the intricacies of the Arabic language, he said, and their youthful passion for democratic change in Egypt. Soon they were having long conversations every day after the course sessions, said the woman, who asked to remain anonymous because her family doesn’t yet know about their relationship. The day before she left Cairo, Fakharany surprised her with a marriage proposal. She didn’t give him an answer at the time. But after she flew home, they continued to talk every day and made plans for Fakharany to come and meet her family in August 2013, a necessary step for him to ask her father for her hand in marriage. It was a meeting that the course of Egyptian politics would not allow him to keep. At the end of June, hundreds of thousands of Egyptians marched throughout the country, calling for Morsi’s resignation. Days later, Sisi, then Morsi’s defense minister, seized control of the country. Many Egyptians welcomed the military takeover with celebration, calling it not a coup but a revolution and describing Morsi’s supporters as terrorists. Fakharany considered it a devastating blow to democracy in Egypt, and Rassd’s coverage was strongly critical of the coup. Two large protest camps formed in the capital, each teeming with thousands of protesters who vowed to stay until Morsi was reinstated. Many, though not all, of the protesters were Islamists, and rhetoric from the stages set up at the sit-ins was often fiery and sectarian, at times blaming Christians for the coup and hinting at violence if the president was not restored. Members of the Brotherhood’s political party, which was under siege from the new regime, were mainstays at the sit-ins. Fakharany helped man a video feed from the larger camp, in Rabaa al-Adawiya Square. Both he and Soltan felt the foreign media were wrongly portraying the protesters as angry Brotherhood supporters, instead of Egyptian citizens protesting an undemocratic power grab by the military. Soltan, a dual Egyptian-American citizen who grew up in the United States, was not a member of the organization, though his father was a senior leader. Fakharany spoke with the foreign journalists he knew and urged them to cover the protests fairly, said Soltan. On Aug. 14, 2013, security forces launched an assault on the Rabaa al-Adawiya camp that lasted 12 hours and likely killed more than 1,000 people, most of them unarmed protesters, according to a Human Rights Watch report. Fakharany was present for the assault and made it out late in the day with a light shrapnel wound to his arm. He had seen the worst of the carnage, his brother Abdulrahman said — the hundreds of bodies piling up as those in the square frantically sought a way out, only to find all exits under fire from the security forces. The new regime had essentially declared war on the Brotherhood and anyone who spoke out against the coup. It embarked on a massive arrest campaign, detaining Brotherhood leaders and members, pro-Islamist journalists, protesters, and activists. Fakharany and Soltan spent 10 days away from their homes trying to avoid the dragnet. They and two others — Samhi Mustafa, also of Rassd, and Mohamed al-Adly, of Amgad TV — stayed together in apartments they believed were safe. Fakharany was gathering footage and information on the killings in Rabaa for the Euro-Mediterranean Human Rights Monitor. They were eventually undone by Soltan’s quest for clean underwear. Whereas the others in the group bought new clothes while on the run, Soltan didn’t know his size in Egypt, as he grew up in the United States and had only been in Egypt for the summer. The four ventured to Soltan’s parents’ apartment to pick up some clean clothes. They had bad timing: While they were there, police raided the home looking for Soltan’s father. He wasn’t home, but the officers were satisfied with their bounty of the four young men. When Fakharany’s fiancée saw the news in a Facebook post from one of Fakharany’s friends — about a week before he was scheduled to meet her family — at first she didn’t believe it. “And then I started to think, how many days will it be? I was thinking, did he go behind the sun?” she said, using an Arabic phrase that describes those disappeared by the state who vanish without a trace. A few days before, Fakharany had given her the passwords to his social media accounts in case of just such a situation. It was evening. She opened her laptop and started deactivating his accounts one after the other to prevent police from using statements he made on those pages against him. “And then I started crying until the sun rose,” she said. Behind bars Nearly six months after Fakharany’s arrest, I was scrolling through my Facebook feed when I saw a post from his account. I was startled. I had been following his case in the media — he was still being held in pre-trial detention. So I wondered how he was posting on Facebook. I quickly typed a message, asking if he had been released. He responded six days later. “Nope, I am still in jail,” he wrote, with a smiling emoticon. “I have smart phone in the cell.” I wasn’t convinced it was really him and wondered if Egypt’s security services had taken over his account. Fakharany started to give me proof, mentioning a time we met at a particular cafe. This wasn’t enough. “What else,” he typed. “The horse in Tahrir square, during camel war.” Back in February 2011, the regime had sent men riding camels and horses to storm Tahrir Square in an attempt to drive away the protesters. It was unsuccessful, and the next day I met Fakharany there. In a dim alley near a field hospital we found a horse, a remnant of the previous day’s attack. The animal looked tired, its head drooping toward the street. Fakharany and I stroked the animal’s nose, feeling sorry for it. Finally convinced I was really speaking with Fakharany, we began chatting. He was matter-of-fact about his situation and sprinkled his sentences with emoticons. Mass media incarceration Fakharany’s case is known in the Egyptian media as the “Rabaa operations room” trial. He’s being tried alongside 50 others — a hodgepodge of people with different backgrounds, including at least five other journalists and senior Muslim Brotherhood leaders, such as Mohammed Badie, the group’s leader in 2013. The inclusion of the Brotherhood leaders in the journalists’ case was a clear attempt by the regime to tar the reporters with the anti-Brotherhood frenzy that swept Egypt after the coup. It “really shapes the way the public is going to perceive” the trial, said Yasmin el-Rifae, who until recently was the senior research associate for CPJ’s Middle East and North Africa program. “I think they were sort of banking on him getting lost in the shrillness of the crackdown that followed.” An Egyptian court banned the Muslim Brotherhood in September 2013, and since then the government has indiscriminately charged journalists and political dissidents with belonging to the group, according to CPJ. Fakharany is charged with belonging to a banned organization, spreading false news, possessing a walkie-talkie, and forming an “operations room” to direct the Muslim Brotherhood to work against the government during the dispersal of the Rabaa protest. Like other recent political trials in Egypt, it made little difference that the prosecution didn’t present evidence to back up the charges. The only evidence presented against Fakharany was the record of his interrogation by state security officers. The court created a technical committee of experts to evaluate the photos and videos the prosecution claimed were fabricated, and the committee found that none of them were falsified. The lead judge assigned to the first trial was Nagy Shehata, infamous for issuing the guilty verdicts in the Al Jazeera trial and sentencing multiple groups of dissidents to death in recent years. As lawyers were giving their defense arguments, “he made statements basically saying that he thought these defendants were guilty,” said Rifae. “That gives you an indication of the level of injustice that was being carried out.” Shehata didn’t even wait for all the accused to finish their defense arguments before issuing the verdict in April 2015, finding all 51 defendants guilty. He sentenced 14 people, including Badie and Soltan’s father, to death for planning attacks against the state. The others, including Fakharany, were sentenced to life in prison, which in Egypt is 25 years. I wrote to Fakharany on Facebook messenger after the conviction. “At least I still have access to Internet,” he typed back with a smile emoticon. “I will never give up fighting.… In the end for sure I get my freedom. Year, 2 or 3 years but I will get it ..Cuz I had a fake trial .. without any evidence without anything so for sure the appeal will cancel the verdict.” He was partially right. In December 2015, a Cairo appeals court annulled the verdicts due to insufficient evidence and ordered a retrial. In the new trial, which began in February 2016, prosecutors have not presented any evidence against Fakharany save the record of his interrogation, said his lawyer, Ahmed Helmy. The best years of your life Fakharany’s parents live in the fifth-floor apartment of a building on a desert plateau outside Cairo. When I visited them in February 2016, his mother was getting ready to visit him the next day. The kitchen was cluttered after a day of cooking in preparation for the prison visit — inmates often depend on the meals delivered by family, and Fakharany’s parents usually bring 20 pounds of beef or a dozen roasted chickens to feed their son and his cellmates. Large chunks of meat were sizzling in a pot on the stove; dishes filled the sink. Fakharany’s father, Ahmed, wore a faux fur hat and rubbed his hands together against the chill. They had brought warm clothes for their son and his cellmates on a recent visit. “The guards said, ‘Oh, these are very, very nice,’ while holding up the clothes,” he said, indicating they would take some for themselves. In January 2016, Fakharany’s situation had gone from bad to worse. He was transferred from Tora prison to Wadi Natrun prison, separating him from friends and harshly downgrading his standard of living. Guards arbitrarily refuse to allow Fakharany’s parents to bring food and clothes or sometimes even to visit. He no longer has access to a mobile phone. When there are hearings in his trial, he’s moved temporarily to Egypt’s notorious Scorpion prison, a maximum-security facility with miserable conditions. His emotional well-being has sharply deteriorated. “The last two times we saw him — he’s not OK,” said his father. “He’s crying too much. He said, ‘I don’t like for you to come and see me without a good face, without a good smile.’” Soltan, who was released in 2015 after coming close to death on a hunger strike and relinquishing his Egyptian citizenship, calls prison “a living man’s graveyard.” Access to a phone, he said, “makes you feel like you’ve got a lifeline.” Without it, Fakharany communicates via smuggled letters. The hardest part of prison, said Soltan, is “seeing the best years of your life just go by — they’re being robbed from you, they’re being wasted, when you could be progressing in your career, when you could be building relationships, getting married, having kids. And I think it’s the thing that eats away at Abdullah. No one expected it to be this long. Everyone thought it was going to be a small crackdown and that’s it.” Egypt’s prisons are bursting at the seams, full of tens of thousands of political prisoners arrested since the 2013 coup. A September 2016 report by the Cairo-based Arabic Network for Human Rights Information estimates that there are currently 60,000 political prisoners in Egypt. The government’s bloody crackdown fed an already simmering jihadi insurgency, and some are worried that the mass incarceration of disillusioned dissidents alongside Islamic extremists could make the prisons a breeding ground for a new wave of jihadis. That isn’t the case for Fakharany. In a two-page handwritten letter to me penned in October, Fakharany said the full scope of the changes he’d undergone in prison wouldn’t be apparent until he was released. But he had experienced some “paradigm shifts,” he wrote. While the “fight for freedom” had previously been an event to cover, “my days in prison taught me that freedom is a life that deserves a fight for.” “Imagine living in a … sociological experiment for three years in a small room with 30 human beings representing the whole spectrum of the social prism,” he wrote. “Surprisingly prison has taught me to deal with a human being not the social hierarchy.” In September 2016, Fakharany began a hunger strike, ingesting only sugar water, to protest his lack of medical treatment. He has an unexplained painful swelling in his leg, which has made movement difficult. In a late September message smuggled from prison, he wrote that prison officials have refused his request to be transferred to a hospital to diagnose the ailment. After he began refusing food, his weight dropped from about 175 pounds when he entered prison to about 110 pounds. In a letter to his fiancée written at the beginning of November, he told her that he had partially broken the hunger strike in order to be able to take pain medication. He ended the hunger strike around the beginning of December, because of his deteriorating health. The imprisonment has affected Fakharany more than any other event in his life. “Three years ago when you asked me, it wasn’t my main priority to be released. But my main priority was to retrieve the atmosphere of freedom, freedom of opinion and expression and freedom of speech,” he wrote in the letter to me in October. “But after three years of false imprisonment … my biggest hope is now to be released, released from the oppression and the oppressor. Despite the fact that I know my release from prison will not return me to be free as before.” But the struggle has not extinguished his idealistic fervor. “Unexpectedly and against all odds the Egyptian revolution is still prevailing in the spirit of the Egyptian youth,” he wrote. “The regime is still feeling the threat of the resurrection of the Egyptian youth uprising.” The day when Egypt’s regime falls may yet be a long way off, but for Fakharany, the future still contains the hope of personal and political triumph. “My pen isn’t able to describe my feelings in this moment,” he wrote in tidy Arabic script over the summer to congratulate Soltan on his engagement. “My feelings are happiness mixed with joy, happiness that you are free to get married and I am still imprisoned, and joy for you that God blessed you.” He asked God to “give us all freedom soon, and allow me also to marry the one I love.” He ended with a smiley face.